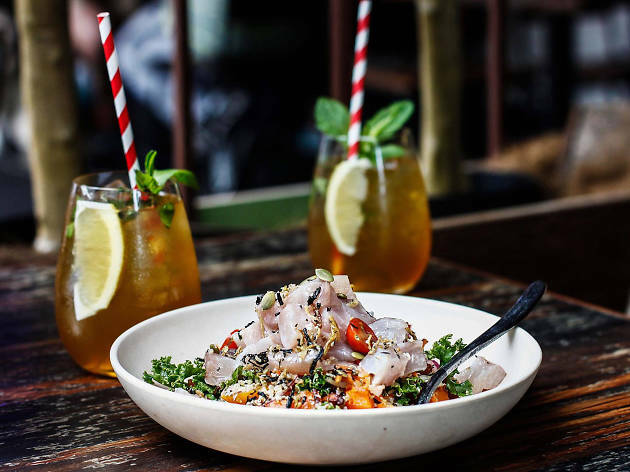 Hawaiian poké is a dish currently sweeping the world and Salmon & Bear seafood eateries in Zetland and Newtown are among the best places in town to eat it. Poké – basically a delicious raw fish salad – has been a highlight of Salmon & Bear since they opened, with tuna, salmon and sweet prawn varieties designed by chef Mark Jensen (who taught at the Sydney Seafood School for 15 years). 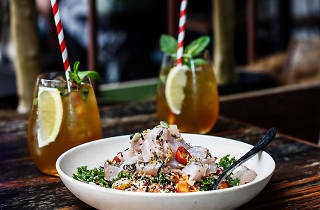 Now Salmon & Bear have created a new kingfish poké: diced Hiramasa kingfish in a miso and sesame dressing served on a salad of kale, quinoa, fennel, tomato, sweet potato, carrot, Spanish onion and pepita seeds. To launch this new dish, Salmon & Bear wanted to support the Newtown Neighbourhood Centre’s First Response Program. The program ensures that anybody who is homeless leaves the centre with a pathway towards getting a roof over their heads. The kingfish poké costs $21, and $2 from every one sold will be donated to the First Response Program, until they’ve raised enough money to get 20 people off the streets. You get a tasty meal, plus the warm feeling of having helped someone in need. Nicely played, Salmon & Bear.